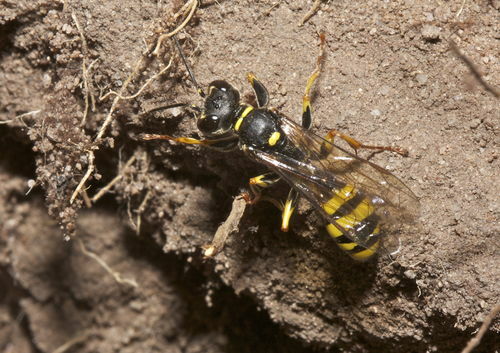 The aculeate hymenoptera (bees, wasps and ants) may be found in almost any habitat but they reach maximum diversity and numbers on areas of sandy soils, particularly those associated with heaths, which provide rich sources of nectar and pollen and ideal soils for nesting. Most, though not all, also prefer a warm climate and hence their abundance is highest in the south east of Britain and lowest in the north and north west of Scotland. 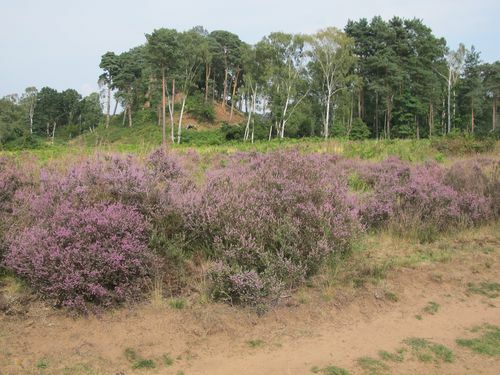 The most important sites occur on the Surrey heaths which have been thoroughly surveyed. There appears to be some degree of recorder bias in the national distributions, i.e. hot-spots occur where competent hymenopterists are active but sufficient data have been accumulated through the work of the Bees, Wasps and Ants Recording Society to make the currently accepted distributions generally reliable. Whilst not having the range of species found in the south of England, Worcestershire is fortunate in lying at the north-west limit of the southern species and on the southern limit of several northern species. For this reason it is key in monitoring any changes in distribution resulting from climate change. Generally the most important hymenoptera sites are found on the north west heaths in the county at the Devil’s Spittleful reserve, Rifle Range reserve, Hartlebury Common, Burlish Top, Habberley Valley etc. though some hot spots are also found in the south west around Bredon Hill e.g. at Kemerton Lake reserve and Beckford gravel pit. 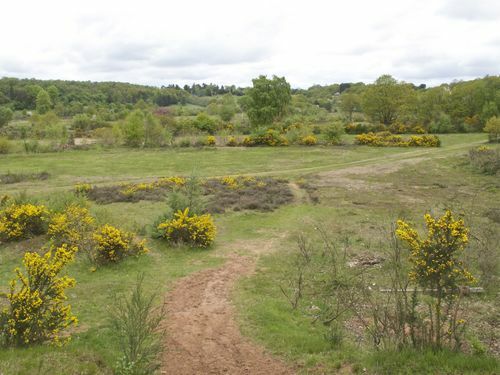 The current study was undertaken at the request of Wyre Forest District Council and Worcestershire Wildlife Trust to provide an up to date species list for the Devil’s Spittleful Reserve (Worcestershire Wildlife Trust) and the Rifle Range Reserve (Wyre Forest District Council). . Pictures 01 and 02 are of the reserves. The importance of the Devil’s Spittleful and Rifle Range reserves and Hartlebury Common in a national context was recognised in the 1990’s by Dr. Michael Archer and Colin Plant, both national experts, when they conducted surveys at different seasons between 1991 and 1997. Since then the reserves have undergone changes as a result of management, ecological succession and, probably, climate change. Unfortunately, since 1997 there has been little recording at any of these sites so the 2013 survey provided the opportunity to assess changes in hymenoptera occupying the Devil’s Spittleful and Rifle Range, using the Dr. Archer’s and Colin Plant’s data as the baseline. The results are shown in the table with other records since 2000 included in the third column. It is immediately obvious how little recording was undertaken between 1997 and 2013. It should be noted that the data presented are from author GHT’s database and there may be a few more records held by Worcestershire Biological Records Centre (WBRC. The bald fact is that between 1991 and 1997 Michael Archer and Colin Plant recorded 136 species whilst the 2013 survey yielded a total of only 65 species. The question is, does the finding of half the number of species in 2013 compared to 1991 to 1997 represent a genuine loss of numbers and diversity? This is a difficult question to answer and, indeed, it is not possible to reach a definitive conclusion. The most obvious difference is that the 1991-1997 survey was conducted over seven years, with some species being recorded only once, whilst the current survey involved a few days over a somewhat atypical year. Atypical in that it started reasonably warm, followed by a cold snap with snow in April which delayed the appearance of many species and may have seriously compromised the breeding success of others. Meaningful answers will only be derived from more recording over several years. We may, however, speculate. A great deal of publicity has been given to the decline in honey bees, mainly because of their commercial importance, but wild bees and wasps have also been in decline, though perhaps not so dramatically as honey bees (Biesmeijer 2006, Carvalheiro 2013). It is likely, therefore, that populations on the reserves will have shown a similar decline with some rare species becoming extinct. We may also ask if it is likely that half the species present on a site would be missed by recording only over a single year. Whilst it is certain that some species will be missed it would be unfortunate indeed if half remained unrecorded, hence the probability is that there has been a decline in hymenopteran diversity. Further support for this view is that in 2013 some very common species e.g. 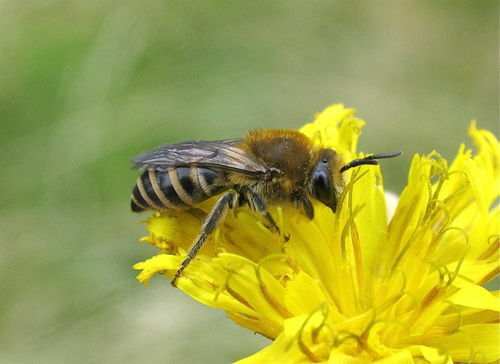 Cerceris rybyensis, Lasioglossum morio and Andrena dorsata appeared absent, pointing to a general decline in species abundance. In the coming years further survey is needed to establish whether or not the decline indicated is genuine or only a temporary blip caused by unusual weather. If a decline is demonstrated then we need to try to elucidate the cause and introduce appropriate site management to reverse it, provided this does not conflict seriously with other priorities. It would also be interesting to compare results at these sites with national data to see whether our experience is a reflection of national trends or whether site specific factors are involved in the changes noted. We look forward to some interesting years ahead. Three species are illustrated in pictures 03, 04 and 05. 03. Colletes succinctus: common, heather specialist species found almost exclusively on heaths. Only occasionally is it found foraging on other plants though has been seen on ragwort. 04. Mellinus arvensis - a common species found widely but particularly on heaths where it may be abundant on heather or ivy blossom in late summer. It catches small flies to stock its nests. 05. 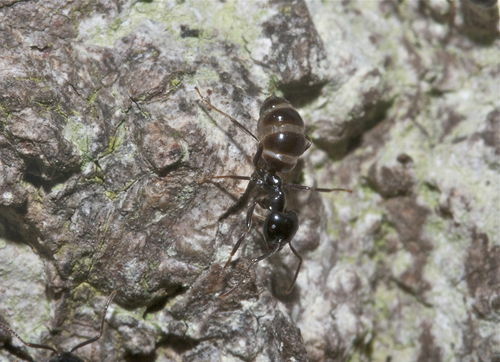 Lasius fuliginosus - a relatively uncommon ant making carton nests under old tree roots or in rotting wood. The queens parasitise nests of Lasius umbratus and L. meridonalis which themselves parasitise L. niger nests. We are indebted to Denise and John Bingham, Harry Green, Andy Jukes, Kevin McGee, Jane and Dave Scott and Brett Westwood for records and many other entomologists who have provided specimens for identification. Archer, M. E. 2004. The wasps and bees (Hym. Aculeata) of the Devils Spittleful nature reserve in Watsonian Worcestershire. Entomologist’s Monthly Magazine. 140:39-49. Biesmeijer, J.C., Roberts, S.P.M., Reemer, M., Ohlemuller, R., Edwards, M., Peeters, T., Schaffers, A.P., Potts, S.G., Kleukers, R., Thomas, C.D., Settele, J.,Kunin, W.E. 2006, Parallel declines in pollinators and insect-pollinated plants in Britain and the Netherlands. Science 313: 351-354, Issue: 5785. DOI: 10.1126/science.1127863. Carvalheiro, L.G., Kunin, W.E., Keil, P., Aguirre-Gutierrez, J., Ellis, W.N., Fox, R., Groom, Q., Hennekens, S., Van Landuyt, W., Maes, D., Van de Meutter, F., Michez, D., Rasmont, P., Ode, B., Potts, S.G., Reemer, M., Roberts, S.P.M., Schaminee, J., WallisDeVries, M.F., Biesmeijer, J.C. 2013. Species richness declines and biotic homogenisation have slowed down for NW-European pollinators and plants. Ecology Letters 16: 870-878. Issue:7. DOI: 10.1111/ele.12121. Plant. C. Records mainly from the 1990s held on Worcestershire Biological Records Centre database and extracted from an unpublished report. The following table shows Devil’s Spittleful and Rifle Range aculeate hymenoptera. Dr. Archer’s and Colin Plant’s data as the baseline compared with the results of the 2013 survey and with other records since 2000. Table 1. Aculeate hymenoptera recorded at the Devil’s Spittleful and Rifle Range reserves by Dr. M.Archer and C.Plant (1990-1997), G.H. Trevis and R.Winnall (2013) and other casual records since 2000.